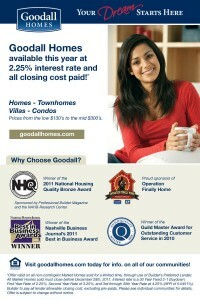 For all Quick Move-In Homes sold between September 7, 2011 and September 30, 2011 that close no later than December 28, 2011, Goodall homes is offering an amazing incentive that you will not want to pass up! Goodall Homes will pay for a 2.25% first-year rate on a 30-Year Fixed FHA 2-1 Buydown and all Closing Costs* when using their Preferred Lender, Wilson Bank & Trust, to finance their new home! Take a look at our Quick Move-In Homes now to pick out your new dream home (Note: Only the homes in the Quick Move-In Homes section of our website that are scheduled to be complete by 12/28/11 are eligible for this incentive. Please call (615) 448-8929 or email Amber Davis at goodallonline@goodallhomes.com for more information on specific homes). *Offer valid on all non-contingent Market Homes sold for a limited time, through use of Builder's PReferred Lender. All Market Homes sold must close before December 28th, 2011. Interest rate is a 30 Year Fixed 2-1 Buydown. First Year Rate of 2.25%, Second Year Rate of 3.25%, and 3rd through 30th Year Rate at 4.25% (APR of 5.0451%). Builder to pay all lender allowable closing cost, excluding pre-paids. Please see individual communities for details. Offer is subject to change without notice.